The Aparai and the Wayana are peoples of the Karib language family who inhabit the frontier region between Brazil (East Paru River, state of Pará), Surinam (Tapanahoni and Paloemeu rivers) and French Guiana (upper Maroni River and its tributaries the Tampok and Marouini). In Brazil, they have lived together for at least a hundred years, in the same villages and marrying amongst themselves. Consequently, very often one finds references to this population as a single group, although their internal differences may be claimed on the basis of distinct historical trajectories and cultural traits. Aparai fazendo um cocar. Foto: Lúcia H. van Velthem, 1975. The present-day makeup and composition of the Aparai and Wayana is the result of the integration of several other groups with whom they have maintained close relations, above all from the 18th Century on. The Wayana assimilated the Upurui, Kukuyana, Opagwana and Kumarawana, among other peoples; while the Aparai incorporated the Apama, Pirixiyana and Arakaju peoples. Although they recognize this primordial diversity and even point to certain individuals as “pure” descendants of some of these groups, the Aparai and Wayana emphasize today that all are “mixed". In fact, it is not possible to know whether all these names, mentioned both by the historical sources and the groups themselves today, refer to distinct peoples, thus corresponding to ethnonyms; or whether they designate smaller units of a single population, referring to subgroups. The first references to inter-marriages and to the supposed “fusion” between the Aparai and Wayana date from the 18th century. From then on, travelers and researchers have pointed to an advanced situation of socio-cultural amalgamation in Brazilian territory, despite the linguistic differences between the peoples. At the end of the 1970s, the Swiss anthropologist Daniel Schoepf gave them the name "Wayana-Aparai", a designation which was rapidly adopted by the public and official agencies and has remained until today. The Aparai and Wayana, however, do not recognize this more general designation, and assert their separateness in different contexts. To do so, they resort to various distinctive elements which they articulate, such as linguistic differentiation, distinct historical origins and trajectories, diverse customs and practices (mythical narratives, songs, cosmological conceptions and aesthetics values). For example, the Wayana supposedly have a broader repertoire of decorative graphic motifs, while the Aparai supposedly have greater technical skill in applying these motifs; Aparai ceramics are painted, in contrast to Wayana ceramics; Aparai had the custom of cremating their dead, while the Wayana prefer to bury them and so on. In short, the social and cultural amalgamation of this population does not correspond to a single identity. The processes of rapprochement and fusion in course are accompanied by movements of distancing and fission in various contexts. In this same sense, individuals who descend from mixed marriages are customarily identified as “mixed” or “crossed”, sometimes in accordance with the paternal group, which will depend on the play of political forces. Despite the fact most are bi-lingual, they tend to give preference to using the language spoken in their village. Each village is identified with one or the other group, according to the language spoken by its founder. There doesn’t result from this, however, any immediate association between the identity attributed to the village and the language spoken on a daily basis by its members. Moreover, there are still several other contexts in which the differentiation between the Aparai and Wayana is (re)produced. Disputes among families, fights between affines, as well as various sorts of misunderstandings are, whenever possible, attributed to and explained by the participation of individuals belonging to any other group. In the Apalai village (also called Bona), for example, the dispute between two prominent leaders, both appointed by government assistance agencies, also tends to take advantage of this distinction, each leader claiming, on the basis of his origins, to represent one of the “ethnic groups” for the assistance agencies. In short, the construction and appropriation of the ethnic denominations "Aparai" and "Wayana" by this population result from the process of interaction with the State, and respond to demands for new forms of representation before the surrounding non-indigenous society. These collective designations have come to regulate much, but not all, of the relations between the groups and contact agents. However, they do so by concealing their internal diversity and by establishing limits which are, in fact, fluid. In effect, these ‘ethnonyms’ refer to a multiple reality, comprised of complex elements which are varied and interdependent, aggregating families, villages, (sub)groups and various other socio-political units. Fazendo um pote. Foto: Lucia H. van Velthem, 1975. The Aparai are mentioned in the literature as: Appirois, Aparathy, Apareilles and Apalaii, by the travelers; Aparis and Apalaís, more recently, by government representatives; and finally, Aparai, which is the way the group calls themselves today. For their part, the Wayana are known in the literature as: Ojana, Ajana, Aiana, Ouyana, Uajana, Upurui, Oepoeroei, Roucouyen, Oreocoyana, Orkokoyana, Urucuiana, Urukuyana, Alucuyana and Wayana. The terms Roucouyennes or Roucouyen (from rocou, "urucum", in French), as well as the corrupted forms Urucuiana or Rucuiana in Portuguese, terms employed in the 18th and 19th centuries, originated from the frequent use of urucu (red dye) body painting by this population. The etymology of the word Wayana, the present-day self-designation of this population, is unknown. It is only known that it is a Karib word, as the suffix –yana, which means "people" in many languages of this family, shows. Both the more general designations Aparai and Wayana, and the names of the various other primordial groups (Pirixiyana, Kumakai, Ahpamano, Arakaju, Upurui, Kukuyana and Kumarawana, for example) are employed on the basis of genealogical references, physical and behavioral characteristics, besides geographical origin. In this way, the Upurui are supposed to be more corpulent and of darker skin, originating from the upper Jarí River; the Apama, lighter-skinned and shorter, are supposed to have come from the lower Jari River; the Pirixiyana, from the Maicuru River, speak more rapidly, and so on. O aparai Sanari fazendo um cesto na aldeia Maxipurimo. Foto: Paula Morgado, 1992. Like the rest of the region, the situation on the East Paru river is one of multi-lingualism. Every adult individual speaks at least two or three languages, including Aparai, Wayana, Português, Tiriyó and, in several cases, Wajãpi, Aluku and criollo. Nevertheless, the distribution of speakers and the use of each of the languages are uneven. In Brazil, the Aparai language is employed preferentially in the dialogues between individuals belonging to distinct groups, which is due in large part to missionary activity between 1968 and 1992. Literacy teaching of this population is done in the Portuguese and Aparai languages, making the latter the language of books and religious services. However, despite the predominance of the Aparai language, over the last decade the Wayana language has gained an enormous prestige among the younger people, since it is used in communication with Wayana and Tiriyó residing in Surinam and French Guiana. According to the historical sources and their own reports, the Aparai and Wayana have distinct origins. The Aparai come from the south bank of the Amazon River, having migrated to the region of the lower and middle courses of the Curuá, Maicuru, Jari and East Paru rivers, and from there to the area they presently inhabit. The Wayana, in turn, have inhabited for a long time the region of the upper and middle course of the East Paru River, its tributary the Citaré, the upper Jarí River, besides the Litani, Paloemeu rivers and tributaries. In the 16th Century, the Aparai inhabited the right bank of the Amazon River, to the south, and, to the southwest, the region where the cities of Macapá and Belém are located today. Other groups, which were later assimilated, lived not very far from the Amazon River, in the region of the lower East Paru and Jarí rivers. At the end of the 17th Century, the Aparai were supposed to have relations with the Apama and Aracaju, possibly Tupi-speakers and inhabitants of the area near Almerim, who were settled in the Mission of Paru, and little by little integrated to the local population. A small Apama group is supposed to have succeeded in remaining isolated in the region of Maicuru until the 1960s, maintaining close relations of trade and inter-marriage with the Aparai. In the mid-18th Century, historical sources mention Wayana settlements on the middle Maroni River, although the greater part of the population was still found in Portuguese territory, in an area delimited to the south and west by the Citaré river, to the north, by the Matawaré stream (on the upper East Paru River) and to the east by the upper Jari River and tributaries. The territory of the Aparai, in turn, included the contiguous region to the south, below the Citaré river, on the middle and lower courses of the Paru, Curuá, Cuminá, Maicuru and Jari rivers. This period was marked by the intensification of relations of exchange, wars and intermarriage among the indigenous peoples of the region. There were notable conflicts among the Aparai and Wayana, on the middle courses of the Paru and Jarí rivers; among the Wayana and Tiriyó, to the north of these rivers; and among the Wayana and Wajãpi, to the east, on the border regions of the territories of these two groups. In the 1950s, the Aparai were still found settled on the East Paru, Jari, Maicuru and upper Curuá rivers of Alenquer; while the Wayana inhabited the middle and upper courses of the East Paru and Jarí rivers, beyond the Litani (French Guiana) and Paloemeu (Surinam) rivers. Until 1960, there were several settlements near the region of Anatum, at the juncture of the Mopecu stream and the lower East Paru. In 1984, only one Aparai village was situated near the confluence of the Jari and Ipitinga rivers. Today, the Aparai and Wayana are distributed in three territorial groups defined by the coordinates of the East Paru River, in Brazil; the Marouni River, in French Guiana; and the Tapanahoni River in Surinam. 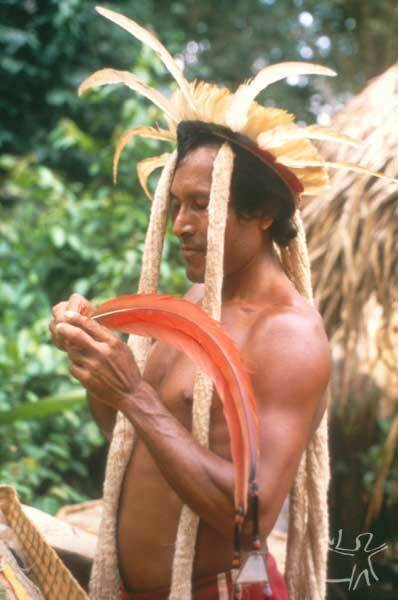 While the great majority of the Aparai is found in Brazilian territory, the Wayana are also distributed in villages in French Guiana and Surinam. This distribution into three distinct territorial groups is the result of their long history of contact with non-Indians, marked by migrations, processes of fission and fusion with other indigenous peoples. In any case, spatial distance does not represent an obstacle to the interaction among these territorial groups, which takes place, basically, through kinship ties and formal trade partnerships. In Brazil, the Wayana and Aparai are distributed in nearly sixteen villages, all of them situated on the upper and middle course of the East Paru River, inside the Tumucumaque Indigenous Park and the East Paru Indigenous Land. These two contiguous indigenous areas cover nearly 4,266,852 hectares in the north of the state of Pará, and are the homelands of Tiriyó, Kaxuyana, Akuriyó and Wajãpi, among other peoples. Although created at different times, the Tumucumaque Indigenous Park and the East Paru Indigenous Land were demarcated and homologated in 1997, by Decree s/ n , published in the Official Diary of the Union, on November 4th of that year. Maruana, roda de madeira confeccionada para ser posta no teto da casa Tukuxipam. Foto: Paula Morgado, 1989. Like most of the indigenous groups of the Guiana region, the social structure of the Aparai and Wayana is characterized by the absence of permanent social units (clans, lineages, age classes, etc. ), by the distribution of the population in small villages (which customarily do not have a population of more than two digits), dispersed and politically autonomous, but interconnected in different degrees by kinship ties, marital exchanges, rituals and trade. In Brazilian territory, the Aparai and Wayana – with a population of approximately 415 individuals – are distributed in 15 villages along the East Paru River. The villages reproduce a formal pattern of organization, composition and size which is widespread among the indigenous groups of the region ( Tiriyó, Kaxuyana, Wajãpi, Waiwai etc. ), that is, relatively small and dispersed, with around 7 to 30 individuals each, organized around kindreds of about to four generations. Formally, the villages are comprised of a married couple, their single sons and daughters, their married daughters, daughters’ husbands and grandchildren (at times, married sons and sons’ wives), coinciding with a domestic group. 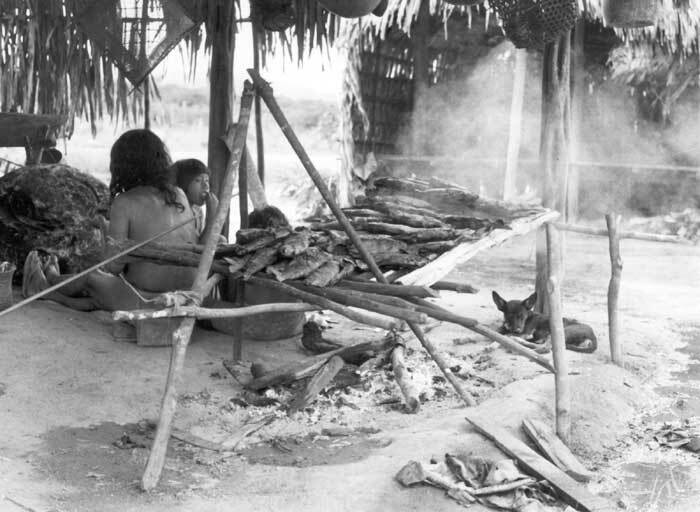 Uxorilocality – the rule by which the married couple goes to live with the girl’s family after the marriage – is not, among the Aparai and Wayana (as well as for all of Amazônia) a categorical rule, but rather a tendency, subject to negotiation among the kin of the spouses and factors such as prestige and political power, social distance, pre-existence of affinal ties, etc. There is no one term in the Aparai language nor in Wayana to designate the domestic group, although this constitutes the nucleus of social organization. Domestic groups establish themselves in large clearings near the riverbanks. Their members can share the same port on the riverbank (where people take care of their personal hygiene), as well as a house for manioc processing and the same “fire for cooking foods” apoto. A set of residences, tapyi (where nuclear families live: a married couple and their single children), corresponds to a domestic group, the houses being arranged around a small plaza. Aldeia no alto curso do rio Paru de Leste, no Pará. No centro, a tukusipan; à direita, o campo de pouso da FAB. Foto: Daniel Schoepf, 1976. The residences, tapyi, consist of several ‘houses': a sleeping house, tapyi; a kitchen or "house of the cooking fire", apoto tapyiny; a house for the production of manioc bread and flour; in several cases, separate from the latter, an “oven house", orinató tapyiny; a house for doing domestic services, such as the making of baskets erohtopo tapyiny; a house for the dogs. In general, the residence tapyi corresponds to a nuclear family, but it can also be the shelter for a widowed grandmother, accompanied or not by one of her grandchildren, or it can even be shared – especially, the kitchen – by part of the domestic group (serving two married brothers or the father-in-law and son-in-law, for example). 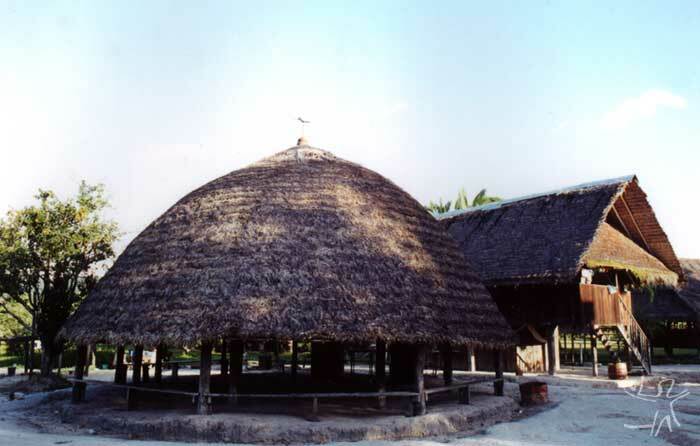 tahkuekemy – a one-story house of oval structure with floorboards and walls of paxiúba or slats of wood, semi-open or closed, with roof covered by ubim and bacaba leaves. tyrakamano – a groundfloor house of oval structure with no floorboards, closed from the roof to the ground with walls of paxiúba or slats of wood, and roof covered by ubim and bacaba leaves. 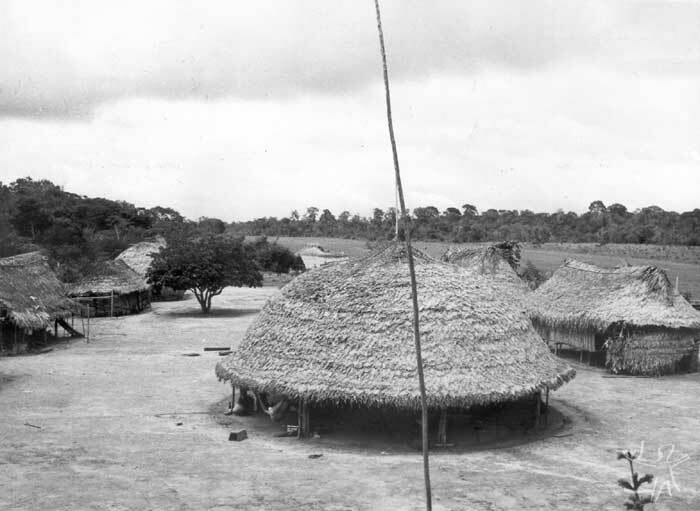 tymanakemy – two-storied house of oval structure with floorboards of paxiúba, semi-open or closed and roof covered by ubim and bacaba leaves. With the moving of the settlements to the banks of the Paru river, besides the reduction in the size of the houses and the change in style of construction, the settlement pattern in the territory was altered, as well as various forms of social relations. Besides that, today there are houses the architectonic pattern of which is modeled on the houses of the caboclos and riverine settlers, rectangular in shape, with floorboards and walls of wood, roofs of zinc, with doors and locks. Besides the fixed residences, temporary houses can be built in the gardens when the gardens are far from the villages. It is up to the chief of the village to choose the place for building of the houses as well as to give consent for clearing of the gardens. In most of the villages, there is a meeting house or “prefecture”, poro'topo (aparai) /or tukusipan (wayana), which stands out from the others in its form and location. Placed in the ‘centre’ of the village, it is visible to all, making it possible to know who has arrived, what he/she is doing, etc. However, if it is a place where all can be seen, its form prevents those who are inside from seeing the others. Such constructions are intended in the first place to receive visitors (from other villages, other Indians and non-Indians) and the holding of festivals (where the adornments are kept). Less than a generation ago, it came to be a place for other “community” activities, such as political meetings and Christian services. If the villages formally tend to coincide with a domestic group, in practice, several villages are made up of more than one group, which are united by kinship ties. In any case, the great majority reproduces the pattern described above. The only exception is the village Apalaí (also known as Bona), which has more than 150 inhabitants, distributed among four principal domestic groups. 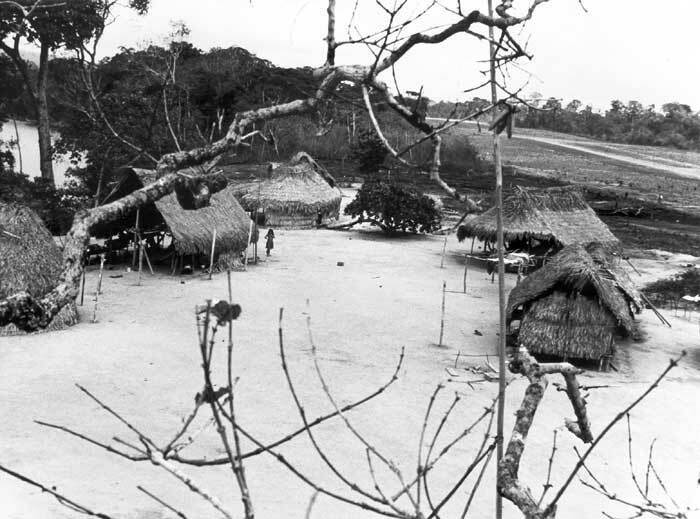 Founded in the beginning of the 1960s with the clearing of the airstrip by the Brazilian Air Force (1969), the installation of a small detachment (from 1973 to 1976) and of a Funai Post (in 1973), the village incorporates a policy of the assistance agencies to concentrate the Indians in a single village, in such a way as to facilitate assistance, among other things. Shortly after its creation, this village actually concentrated 60% of the total Aparai and Wayana population in Brazil. Vista parcial da aldeia Anapuaka no médio-alto Rio Paru de Leste, no Pará. Foto: Daniel Schoepf, 1978. However, the location of Apalaí village does not correspond to indigenous cultural criteria – nearness to clean rivers abounding in fish, lands which are proper for gardening (fertile soil and with no ants), raw materials and fuel (lumber, firewood, vines, etc. ), distance from the old longhouses (above all those that were abandoned after the death of the chief), wells and deep waters —, but rather it serves the interests and convenience of the employees who work there. Consequently, after the first years of population concentration and sedentarism around the Funai post in Apalaí village, demographic growth was then accompanied by a gradual revival of the traditional pattern of dispersed habitation and decentralization of the territory. New villages were founded, although on the East Paru river and near the existing assistance posts, in such a way as to conciliate the traditional pattern of village composition and size with access to assistance, communication, consumer goods and salaried work. Aparai and Wayana villages are intrinsically connected to their respective founders and chiefs. In general, the one who founded a village is its chief, pata esemy or tamuxi. The existence of the village is subordinate to the life of its chief, to the extent that his death tends to result in the dispersion of its inhabitants who found new villages or migrate to already existing villages. Nevertheless, to understand the existence and reproduction of the Wayana and Apalai villages, it is necessary not only to consider the relations formed inside the villages (by its chief with the other members), but also those which connect the villages amongst each other. Aparai and Wayana villages are interconnected through ties of consanguinety and/or affinity (intermarrriages), networks of cooperation and solidarity (services rendered and mutual aid), exchanges of goods, rituals etc. Ideally, the spatial distance among the domestic groups and villages tends to coincide with the social distance among the same. That is, co-resident domestic groups, as well as neighboring villages, are nearer and their relations more intense than with more distant domestic groups or villages. Villages that are spatially closer to each other and hence, more intensely related, make up a larger social unit, which can be called a local group. The local group is not, by any means permanent nor can it be summed up in terms of territory or kinship. To the contrary, it has a transitory nature. The network of sociability that connects one domestic group to another is not so small that it is limited to the population of a small village, nor is it so broad as to include the whole Aparai and Wayana population with the same degree and intensity of relations. That is, the local groups are agglomerations where there is a greater density of relations, where a certain endogamy predominates, although within the local groups, the domestic groups seek to diversify and expand their alliances to beyond the local group. The local group can be identified through genealogies that reveal the existence of consanguineal and/or affinal kinship ties, for more than two generations, between two or more villages. It corresponds to a group of two or more villages connected amongst themselves through ties of consanguinety (particularly, filiation or brotherhood) or through the repeating of affinal ties for more than one generation. It is very probable that the category aparai –ekyry, translated as "kin", designates the members of the same local group. 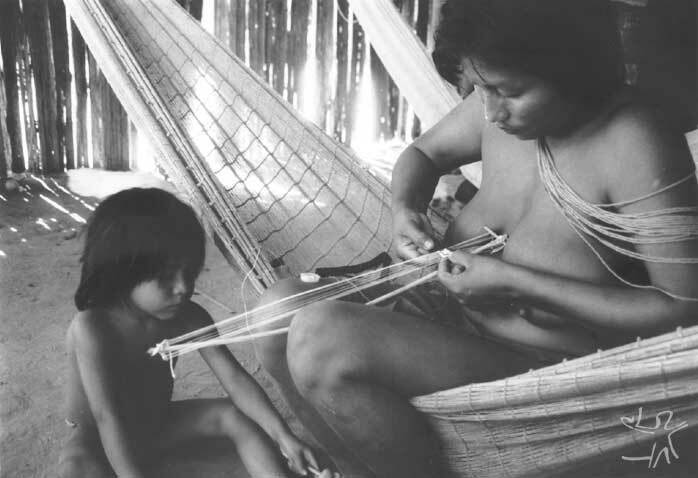 Generally speaking, the Aparai and Wayana kinship terms, like other systems in a large part of Amazonia, are characterized by the absence of groups and rules of descent and rest on the basic dichotomy between consanguineal and affinal relatives, which is expressed by marriage among bilateral cross-cousins (preferentially, the young man marries the mother’s brother’s daughter and the young woman the father’s sister’s son). On a level restricted to intra- and inter-village relations, there is the category of -ekyry, translated by the Indians themselves as "kin", encompassing several consanguineal and affinal positions, co-residents and non-co-residents. The use of expressions such as -ekyry manory or –ekyry poto rokene ("false kin", "not very kin" or "a little kin") indicates the existence of classificatory gradations in the use of this category, which denote degree of proximity/distance in genealogical and/or geographic terms. To a certain degree, one is dealing here with a classification in terms of degree and intensity (“more” or “less” kin) and not in terms of nature, referring to a gradient of sociological proximity, which is not reducible to a simple diametrical opposition between “kin” and “non-kin”. Tukusipam na aldeia Twemke, na Guiana Francesa. Foto: Paula Morgado, 2001. Other categories which have an important social role are -poetory (in Aparai) and peito (in Wayana), which are applied to the co-residents and subordinates of a village chief, being translated as "kin", "people" and even "employee". In the first place, one is dealing with the generic form for referring to all those who inhabit the same village, and are thus subordinate to a common chief. In the second place, this category represents an ‘institution-relation’ widespread among Karib language-speaking peoples of the Guiana region. Generally speaking, these cognates highlight the incorporation of someone to the village or to the local group as a potential ally, whether as a son-in-law (daughter’s husband) or brother-in-law (sister’s husband), who has been brought into the group through uxorilocality or as a war captive. Opposed to the groups of "kin" -ekyry and "co-residents" -poetory, is the category of alterity pãna (or pawana, in Wayana). Both for the Aparai and the Wayana, these categories designate 'outsider', 'non-kin', someone who is not yet known and/or members of other ethnic groups, Indians and non-Indians (note that on the upper Maroni, tourists are called pawana). They belong to a wide array of cognates in Karib languages, which have slightly different meanings in each place. For most of the Karib groups, including the Wayana, pawana and its cognates denote the ‘formal trade partnership', established with unrelated individuals. However, among the Aparai, pãna refers only to unrelated and socially distant individuals, and another term is used to designate the ‘formal trade partnership', -epe. In any case, the 'formal trade partnership (or "friendship"), -epe (pawana, in Wayana), is established withsomeone to whom one does not have a relevant kinship tie, nor geographical proximity – generally, with a member of another ethnic group, Indian or non-Indian (Tiriyó, Wayana of Surinam or French Guiana, Black Maroons or Meikoro and Brazilians). One is dealing here with a specific dyadic relation involving the offer of presents, exchange of goods and hospitality, which is marked by exclusiveness and loyalty. Among such trade partners, a request can never be refused, a commitment can never be forgotten, even if it is only honored years later. Conceived as a symmetric and lasting relation, it rests on a form of deferred reciprocity, over the long run, based on mutual advance payments and debt-making. The Aparai and Wayana designate the other indigenous groups of the region (Wajãpi, Tiriyó, Akurió, Hixkariyana, Galibi and Palikur, among others) by these same ethnonyms, without integrating them into an overall category. This, however, does not exclude the phenomenon of ‘Aparai-zation’ or ´Wayan-ization´, that is, all the nearby indigenous groups are assimilated to their ethnic group. A common trait of the groups of the Guianas is to conceive of their more narrow relations with other groups as a process of “acculturation” and “socialization”: each group sees itself as an agent of “socialization' (according to its own patterns) of the other to whom it is related. The Wayana 'wayanize', os Aparai 'apara-ize', the Waiwai 'waiwa-ize' and so on. This 'socialization' takes place by means of trade and intermarriage, resulting, in the last analysis, in fusions like those which occurred in the past, and which gave rise to the present-day Aparai and Wayana. By 'socialize' is meant teaching the ethos of the group to others (its values, norms of conduct, etc.). Partial view of Bona village (old name for Apalai village). Central yard, and family houses of a semi-traditional type. In the background, the FAB landing strip. Photo: Daniel Schoepf, 1972. Nevertheless, the term ‘aparai ituakyry’, literally translated as “inhabitant (or people) of the forest", designates for the Aparai and Wayana all the isolated and hostile uncontacted indigenous groups, who inhabit the interior of the forest. Such "wild Indians" are opposed to the “domesticated” indigenous groups, which presently inhabit the banks of the rivers (among which are the Aparai and Wayana). With the intensification of relations with the surrounding society and, consequently, of the dichotomy between Indians/non-Indians, the word ituakyry has acquired a new, more inclusive, meaning, designating generically all indigenous groups, isolated or not, "of the forest” or "of the rivers", "wild" or "domesticated", including the Aparai and Wayana themselves. Among the non-indigenous groups and other social groups with whom they relate, the Aparai and Wayana differentiate the Boni, Djuka, Saramaká (descendants of Black slaves from Surinam), to whom they attribute the generic category of meikoro. 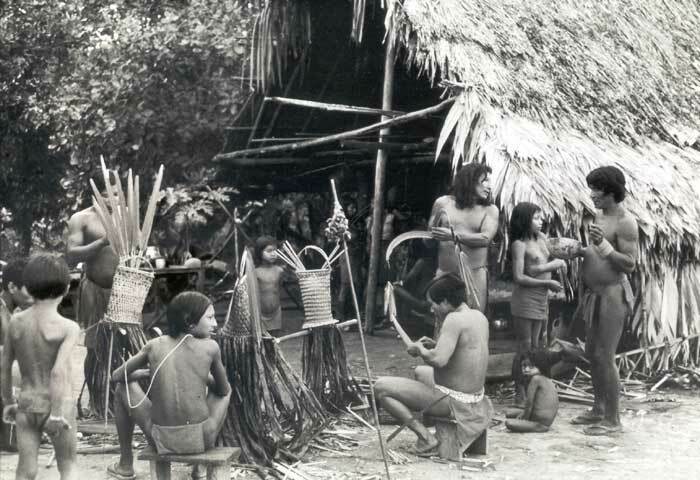 Brazilians are called karaiwá, which includes without distinction the old rubber-gatherers, cat-hunters, prospectors, officials of the FAB, employees of the Funai, researchers, etc. The terms parassissi and urantê refer to the non-Indians of French Guiana and Surinam, respectively. Índios com o Frei. Foto: Protasio Frikel, 1955. In the first reports of the chroniclers and travelers, it is possible to find comments regarding wide networks of relations and circuits of exchanges that, throughout the region of the Guianas, inter-connected initially only the indigenous groups of the region, but then later progressively began to incorporate segments of the surrounding non-indigenous society. The indigenous groups were found connected to each other through diverse modalities of relations – wars and shamanic aggressions, exchanges of goods, intermarriages, fusions and fissions –, among which specialized commercial transactions stand out as important, in which monopoly of production and/or supply of a certain item was attributed to each group, established through individualized and exclusive formal trade partnerships. Besides that, due to the large number of exchange routes that crossed through the territories of the groups, the specialized pattern of production and supply of goods, and mainly, a larger strategy of diversifying and guaranteeing alliances, each group was found connected to several others at the same time. The present makeup of the Aparai and Wayana groups (both resulting from the fusion and integration of several other smaller groups), the close relation and high degree of intermarriages between these groups in Brazilian territory, the fact of sharing a vast lexicon of which several words are of Tupi origin indicate the intensity of contacts and inter-relations between these groups and with other groups of the region. One must also consider that the available information on the participation of the Aparai and Wayana in these networks of relations, like all historiography of these networks, is mixed with the increasing introduction of European merchandise in these systems of relations during the colonial period, by means of commercial transactions between the Europeans and the Indians of the coast, in the region of French Guiana and Surinam, above all, in the 17th and 18th centuries. European merchandise and industrialized goods which the Aparai and Wayana are familiar with and have been dependent upon for a long time. In the 18th Century, there occurred a massive migration of ex-slaves from the sugar plantations of the then ‘Dutch Guiana’ (present-day Surinam) to the forests in the south of French Guiana. These slaves formed large tribal organizations, following their ancient African patterns, dividing themselves into three major and rival ethnic groups: Boni, Djuka and Saramaká. In the literature, these ethnic groups are generically called Black Maroons (or Bush Negroes, and Noir Marrons in French). The Wayana and the Aparai call them Meikoro, although they recognize their differences. After that, taking advantage of their favorable geographical location along the main rivers and penetration routes into the interior of Eastern Guiana, these ethnic groups of ex-slaves – the Meikoro – went on to conduct commerce with the coastal colonial posts and with the indigenous groups located in the interior, serving as intermediaries in the flow of goods between Europeans (colonists) and Indians. The Meikoro provided European goods to the indigenous groups with whom they had direct relations– particularly, the Wayana and the Tiriyó –, who, in turn, passed these goods on to other indigenous groups in the interior (the Aparai and the Wajãpi, for example), and so on, forming a long chain of intermediated transactions. Besides that, the suppliers of European articles and their ‘clientele’ were formally identical along these chains of negotiation. The asymmetry and advance payments of goods characteristic of the relations between the Boni and the Wayana – in which the Boni obtained enormous profits, paying little for the indigenous articles which were then passed on at high prices to the Europeans – were reproduced and transferred to the transactions between the Wayana and the Wajãpi of the Oiapoque, and between the latter and the southern Wajãpi. Consequently, both the Wayana themselves and the Meikoro, and even the other indigenous groups, sought to acquire and secure favorable positions as intermediaries in these systems of trade. The groups disputed for good positions in these networks of relations, seeking to keep their ‘suppliers’ away from their ‘clients’, often resorting to wars amongst themselves to do so. Until the end of the 19th Century, the Wayana and Aparai of Brazil benefited from this trade and their position, serving as intermediaries in the transactions between the Meikoro and other indigenous groups (Tiriyó, Wajãpi of the Oiapoque etc.) and controlling access of the latter to manufactured goods. In the same way, while the Meikoro controlled the flow of European merchandise into the networks of Amerindian trade in the region, the contacts of the Aparai and Wayana with segments of the surrounding, non-indigenous society were sporadic and indirect, and the availability of industrialized good relatively limited, which allowed the Aparai and Wayana to gradually become familiar with these goods, without compromising their culture and ways of life. It was only in the beginning of the 20th Century, when the exploitation of castanha nuts and rubber expanded in the Jari, East Paru, Maicuru and Curuá river basins, that contacts with caboclos of the region intensified. Rubber extraction lasted until the 1950s, reaching its apex between the decades of 1920-40, when it represented the principal economic activity of the region, responsible for the emergence and development of various small towns and municipalities, such as Almeirim, Alenquer and Monte Alegre. During this period, the Aparai and Wayana still inhabited the lower and middle course of the Maicuru and East Paru rivers, the Citaré tributary and the middle Jari. The ease of access the Indians had to these centers of commercialization and the rubber-workers to the villages made contacts and interchanges still more frequent. Many Aparai and Wayana worked for or on these extractivist frontiers, providing food, rendering services or even extracting rubber, in exchange for industrialized merchandise (shotguns, tools and trinkets) or money. The nearness and ease with which most industrialized goods came to be acquired made the commercial transactions with the Meikoro of Guiana decline significantly in importance, since these transactions demanded major voyages. 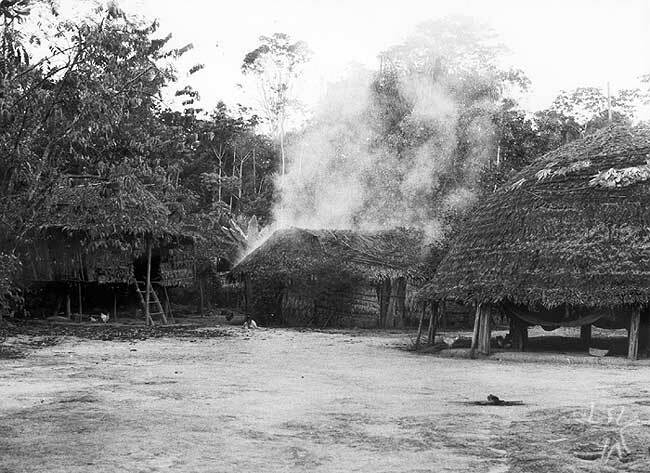 From the 1950s on, with the end of the rubber cycle, the region came to be exploited by cat-hunters (jaguar skin hunters) and prospectors who, until the mid-1970s, maintained intense relations with the Aparai and the Wayana, circulating in their villages, trading food and indigenous services for industrialized goods. The increase in contacts with these economic frontiers caused severe epidemics which in a short time reduced the Aparai and Wayana population in the region. Besides that, these frontiers were responsible for the recent Aparai and Wayana spatial movements which came to gradually form the present-day territory of the Aparai and Wayana in Brazil. That is, the abandonment of the settlements on the Jari, Maicuru and lower East Paru rivers, concentrating on the middle and upper courses of the East Paru. One observes that, most of the time, the relations between the Indians and the representatives of these frontiers have respected several traditional patterns of relations of formal trade partnerships. That is, by being formed between individuals (in the form of ideally exclusive partnerships) and by means of deferred reciprocity (advance payments and ‘credits’). Given their inter-individual nature, conflicts, when they did occur, did not extrapolate the family unit, nor did they compromise the relations between the Aparai and Wayana with non-Indians as a whole. The view that the Wayana and Aparai today have of this past is marked by a certain nostalgia and by the idea that these karaiwa (the rubber-workers, cat-hunters etc.) were good trade partners, fulfilling their functions in the networks of relations with efficiency, particularly as providers of goods. From the end of the 1960s, the Aparai and Wayana came to be assisted by the governments of Brazil and French Guiana, through official government agencies or faith missions. These institutions were responsible for the type of health and education service implanted and for the demographic growth of these populations in the last several decades. Nevertheless, their presence provoked major transformations in the relations between the indigenous groups of the region and between these and several segments of the surrounding society. 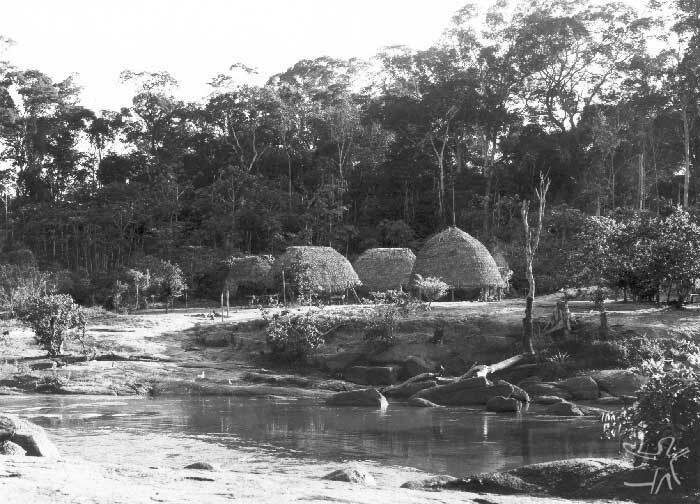 In Brazil, the Aparai and Wayana began to receive assistance in the 1960s, after a landing strip was made and a detachment of the FAB was established on the banks of the East Paru River, in the present-day Apalaí village. From 1962 on, missionaries of the SIL (International Linguistics Society) began living with the Indians and remained there until 1992, translating and preaching the New Testament in the Aparai language (translated in 1988) and training indigenous pastors who today are in charge of the celebration of religious services. The Funai created the first post in 1973, and began to provide permanent assistance in the region which has lasted to the present day, in a way that is marked by paternalism on the part of the official agency, and which has promoted the growing dependency of the Indians in relation to these policies and to industrialized goods. With the purpose of integrating these populations into the national society – although uninterested in providing means to guarantee their autonomy in this process -, the indigenist policies implemented have worked on behalf of ‘educating’ and familiarizing the Indians with the monetary economy and the selling of salaried manual labor. Among these policies, the following are noteworthy: stimulating the production and commercialization of artwork, the installation of 'canteens' and trading posts for selling industrialized merchandise in several villages, the hiring of Indians to perform temporary or permanent services. To the extent the possibility of acquiring industrialized goods within the indigenous territories increased (through salaried work and the trading posts), the interest for the goods produced by other indigenous groups diminished. The secure relations with the assistance agencies came to be favored, in detriment to the relations with their old partners and allies: both the Meikoro and other indigenous groups (Tiriyó and, principally, the Wayana of Suriname and French Guiana). The voyages and relocations diminished, since the groups began to concentrate ever more around the assistance posts ‘confined’ into restricted areas. Over the last few years, among the factors which have most contributed and facilitated the Aparai’s and Wayana’s acquisition of industrialized goods, the following are noteworthy: the receiving of retirement pensions paid by the state government of Amapá (ever since 1994); the hiring of Indians for paid jobs (from the end of the ‘80s), such as assistant health agents and teachers; and the commercialization of artwork, initially mediated by the Funai Administration in Macapá (1980) and presently by the Association of Indigenous Peoples of the Tumucumaque (APITU). Nevertheless, the Aparai and the Wayana have made efforts to maintaining, at least ideally, the largest number possible of partners and potential allies among other groups, indigenous or not (prospectors, Meikoro, Tiriyó etc.). In this sense, several individuals, above all in the villages near the southern border of the indigenous area, usually go to work and perform services in the prospecting sites nearby, ‘Treze de Maio’, ‘Limão’ and 'Santa Clara'. The Funai has made an effort against these activities, by means of ‘educational campaigns’ and threats, given that individuals usually bring from the prospecting sites, besides gold and merchandise, malaria and other contagious diseases. Despite the pressure from the Funai, many individuals, particularly those who have major difficulties in going to the cities of Macapá and Belém, continue visiting the prospecting sites with relative frequency, on trips that last from one to six months. The most experienced individuals actually work in the prospecting site itself, however, most usually do some other kinds of jobs, such as fishing and selling fresh fish to the prospectors in exchange for gold. The gold obtained in these activities is usually spent in buying goods in the ‘sheds’ of the prospecting sites (from ammunition to crackers etc.) or is kept for future transactions in the villages or nearby cities. For, among the more experienced Indians, gold serves as a means of trade in purchasing various industrialized goods, such as fuel etc. Several individuals are already well-known on these prospecting sites, and have friends and credit among the prospectors. Despite the long distance and political instability in Surinam (it seems, replete with conflicts and small guerilla warfare in the interior), the Aparai and Wayana in Brazil still make voyages to Surinam, during which industrial goods and indigenous artifacts are traded, and kinship ties and formal trade partnerships are renewed (-epe and pawana). There are two types of voyages. One is done by married couples with or without children and is less frequent these days. 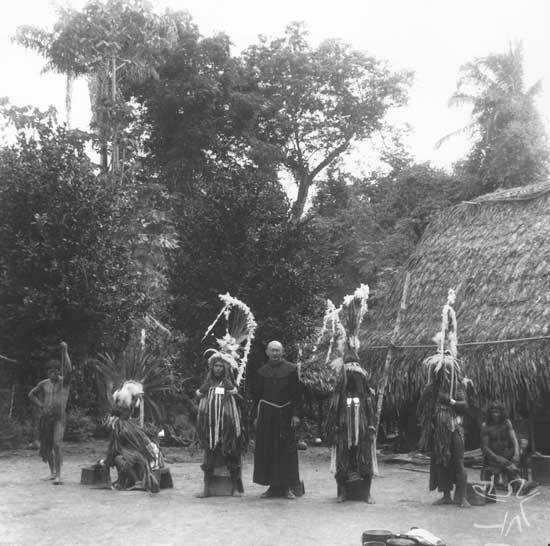 The other involves the organization of small expeditions of about 15 to 20 individuals (most, single men) the pretext of which is the annual ‘christian’ meetings, organized in the Tiriyó villages of Surinam. These meetings, which the Indians call ‘Conferences’, bring together various indigenous groups (Tiriyó, Wayana, Aparai, Waiwai, Arawak etc.) and non-Indians (Meikoro, North American missionaries and missionaries of other nationalities). On these voyages, as important as the time they stay in the ‘Conference’, are the contacts established along the way. From the East Paru River in Brazil, to the Tapanahoni River, in Surinam (where the Tiriyó villages are located in that country), and Litani in French Guiana, the Aparai and Wayana go through settlements of the Meikoro. They take advantage of these journeys to go to the cities situated along the Maroni River, Maripasoula and Saint Laurent du Maroni, in French Guiana, or to the capitol of Surinam, Paramaribo. Besides that, there are alternative routes that go through the 'Tiriyó Mission' on the East Paru River (Brazil). On these visits, one takes advantage of the moment to catch up on news and exchange information, make transactions, place orders for goods and receive goods ordered on this triple frontier. All kinds of goods are traded (radios, rifles, and trinkets in general). Nevertheless, there are specialized goods that have a differential status (although they circulate in the same spheres of trade). These include agate plates and bowls, skillets and iron pots (for producing caxiri) which come from Surinam and are highly prized by the Aparai and Wayana of Brazil; several adornments of material culture (particularly, the rattles for the arukó/kawai festival) and hunting dogs brought from Brazil to Surinam, where they are also highly prized. Finally, the young Aparai and Wayana coming from Brazil seek to find out the latest in fashions which are spread by the Tiriyó and Wayana of Surinam, such as haircuts, evangelical or pop music, etc. Other places where the Aparai and Wayana seek to establish alliances are the cities of Macapá, Belém and the small municipalities and towns nearby (such as Almeirim). Several individuals go frequently to these cities for various reasons: to commercialize artwork, receive retirement benefits, medical care etc. On these trips, the Indians seek to diversify partnerships, not limiting themselves to their relations with the assistance agency. They seek to establish other contacts to sell artwork, such as to stores and street peddlers (camelôs); evangelical or Catholic churches; non-governmental organizations, municipal, state, and federal government agencies. Besides that, because of the more or less frequent stay of several individuals in the cities of Macapá and Belém, the Aparai and Wayana have maintained relations with other groups, old enemies (such as the southern Wajãpi) or unknown groups (such as the Gavião and the Kayapó). In the ‘Houses of the Indian’ of these capitol cities, the exchanges are intense, not to mention the sexual contacts among young people. It is the elders who detain the traditional knowledge, although their number is proportionately ever smaller within the population as a whole. Among the elders, the most renowned and, at the same time the most feared, are the shamans who develop a specialized and esoteric knowledge that allows them to maintain communication between the social world and the spiritual world. In what follows, a brief summary of cosmological knowledge is presented. Due to the research conducted, the terms presented are in the Aparai language, but, whenever possible, Wayana equivalents are presented. It is worth pointing out that not always are such correspondences in meaning possible, there being words in one language that do not have correlates in the other, which comes to reinforce the linguistic (and ethnic) differentiation between the groups. For the Wayana and Aparai the relations established with the inhabitants of the forest or the rivers are very close to those forged with the beings of the sky and the subterranean world. The earth is conceived as a kind of round island, surrounded by water, which ends where the sun sets, in a place inhabited by several entities that hold up the sky on their backs. In the past, the sky and the earth were connected by a mountain or by a vine. The origin of all peoples is a certain place, to the north of the East Paru River, in the region near the Tumucumaque mountain and which, curiously, geographically separates the three present-day territorial groups. Between the headwaters of this river and the feeder rivers of the Parumo, a branch of the Tapanahoni River, Surinam (where up until a short while ago they had kin), the Indians mention the existence of a mountain that separates the two rivers and which seems to correspond to the mountain that connects the two skies. 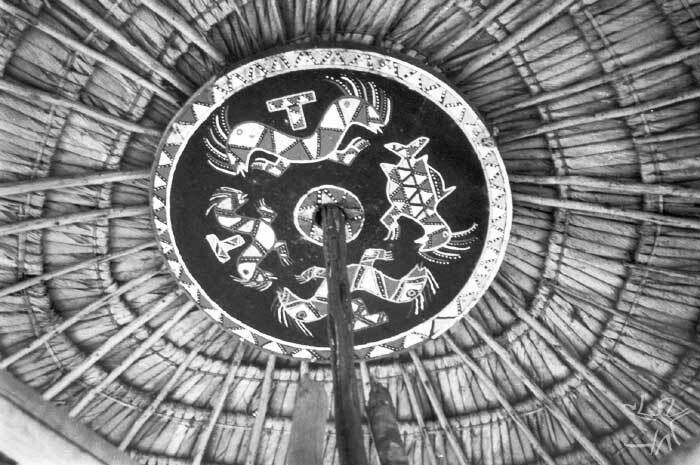 There are two overlapping skies: the lower one, kapumereru, the region of the cirrus clouds, where the jorokó and the kurumu (vultures) dwell, residence of the creator hero Mopó; and the upper sky, kapu, dwelling of Ikujuri and other supernatural entities, where the stars, Sun and Moon are located. Beyond this sky, there is a plateau that is connected to the earth, inhabited by beings "that look like people", Aparai with dark Brown skin; below the earth, there is another layer where beings live who do not look like people, with skin that is like the Aparai, but with their bodies covered with fur. This world has its own sun. The beings that inhabit the lower sky, the jorokó and kurumu (vultures), have an important place in cosmography. The vultures are like “people in the sky”, living in villages like men. The Aparai and Wayana distinguish various species of vultures, locating them in “villages” in space, for some people, also located on layers. There is a myth they know that explains the strong cynegetic connection with the vultures: thanks to their feathers, obtained through a system of trade, the men are able to hunt better. The men, in turn, must leave the rest of the meat they do not want for the vultures. In their relation to the jorokó, both their knowledge and the toponymy are diffuse, and it is in relation to them that the Aparai and the Wayana are always watchful and more fearful. Like many groups of the Guiana region, there is a prevalent belief in a supreme impersonal power, which does not exercise any direct influence on the lives of the Aparai and Wayana, and precedes the origin of the creator heroes. There are two great creator-heroes: Mopó and Ikujuri (or Kujuli, in Wayana). Both are responsible for the creation of the beings and elements of nature and for the present-day composition of the Cosmos. Once the creation of things was concluded and, tired of the disobedience of the beings they had created, these heroes go off to the upper sky, definitively losing touch with men. The Aparai associate the "father of the sky", or the great chief that inhabits the heavens with Mopó, while for the Wayana it is Kujuli. The myths attribute to Mopó the creation not only of the beings and elements of nature, but also the first artifacts (initially made from clay), the technologies that were to facilitate the lives of men and also shamanistic power. Nevertheless, by virtue of his ambivalent nature, his good intentions are not always understood, and in the myths he often appears to be lying or deceiving. Different from Ikujuri, who in the myth is called by consanguineal kinship terms ("father", "grandfather", "brother"), Mopó is always called by the term for affine, kono, which means "in-law". It is worth remembering that, on the plane of social relations, this is a tense relation that demands a reciprocal exchange of favors. We could raise the hypothesis that from this there is the suggestion that the principle of creation/transformation, in acting on the natural world (without the participation of men), does not create a situation of tension or conflict, while, in acting on the plane of human relations (Mopó creates the instruments for the men and teaches them how to transform nature), it engenders states of conflict or competition. One also notes that, every time a reciprocal trade is established between men and beings of the universe, their relationship is marked by terms of consanguinety, which could confirm the model of social relations predominant in the Guianas in which the pair consanguinety/affinity is expressed by a relation of tension/reciprocity. The term Ikujuri often appears not in noun form, but in adjectival forms ("that also was ikujuri" or "he knew how to be ikujuri”), leading us to conclude that Ikujuri would be more than a “creator hero”, but rather a quality or “creator and transformer” principle attributed to several beings (or even a principle present in the world). In reality, there seems to have existed more than one creator hero, more than one Mopó, Ikujuri, or their descendants who continue their work. The existence of Ikujuri in the world allowed the elements which are part of him to be created and constantly transformed (rivers, plants, animals etc. ), which explains the presence of the use of shamanistic power in the myths in which he appears. If today humanity does not participate more directly in this transformation, the world continues to go through transformations: the jorokó take on animal forms to attack, the powerful shamans can transform themselves into jaguars, the beings that inhabit the depths of the rivers are anthropomorphized etc. Humans are endowed with a triple structure: the body, punu, its vital principle, uzenu and akuarihpo, which after death separates from the body. The punu shapes the perceptible image not only of men but also of animals, and can be understood as the covering of the vital principle, which is part of the composition of the whole organic being (plant or animal). The shade, omore (omole, in Wayana), is the material projection of the uzenu. This has the feature of being "volatile", and can easily be separated from the body. There are four ways the uzenu can become absent from the body: during sleep, through the aggression of a jorokó who voluntarily or, acting on the order of a shaman, robs it from the body; when the victim is frightened; or at death. Only the shaman has the capacity to voluntarily send his uzenu out of his body, during sleep, in a curing session or even when he wishes to harm someone. His uzenu causes great fear, for it is capable of being controlled and killing. Small children are the most vulnerable to the loss of their uzenu, for bodily growth is associated with maturation and strengthening of this principle. When a person comes into this world, this vital energy is still in the phase of development, and continues to form until about three years of age, which coincides with the motor control of the child. Until this age, the uzenu is still not totally fixed to the body, and is dependent on the uzenu of the parents, which explains a whole series of precautions that have to be obeyed during pregnancy, post-partum, in the first years of life and when the child gets sick. It is very common to watch mothers perform the same gesture with the hands, along with blowing of the breath, over the body of their small children every time they fall down. Mothers also get quite upset at the possibility of their being frightened and a good part of phytotherapy has to do with infantile medicine, despite the fact that today, Western medicine is integrated into the system of personal care. At death, the uzenu separates completely from the body, crosses over the ropes of the hammock and goes up to the sky, definitively losing contact with men. Some say that after death, it can go to xipahtai, described as a celestial river, located on a very high hill to the east. They refer to it as the center of the world, the good earth at the place where the sun rises. There no-one needs to work, the houses don’t have to be remade, it is not necessary to plant, for, it is a land of plenty and no-one gets old. Different from the joroko, which are inaccessible, in nature there are in the waters and the forest, visible beings, with which simple contact can be fatal. Several correspond to our zoological classification, others don’t. The “imaginary” beings are put on the same plane as those that really exist. To resort to these fantastic beings is tangible proof that the human intellect can do without empirical referents and that mental operations can pre-exist zoological data. The most feared animals are the jaguars, like the kaokakoxi (two-headed jaguar), snakes and lizards. Among the beings of the forest these are considered the most dangerous, for they never die nor can they be killed, under penalty of causing some type of evil action: kaokokoxi ("lizard/two-headed jaguar"); kumepepyimo ("centopede"); kutekute ("black jaguar that looks like a puppy, but when you play with it, it grows in size and never dies"); kaikuxi tymeremy ("spotted jaguar"); kaikuxi kapauimano ("red jaguar"); maracajá ("small jaguar"); maxipurimo ("big anteater"); iou ("big jaguar"); merimo ("jaguar that stays on top of a tree"); turupereimo ("lizard/big snake that exists in the hills, the color of its tongue is like a macaw feather"). But what differentiates these “dangerous” beings from the rest? In the first place, their physical aspect: each one is, or can assume the monstrous form of its species, indicated by the suffix imo, such as: arãtareimo (big howler monkey), mekuimo (big macaco prego – a species of monkey), maxipurimo (big anteater), etuimo (big woodpecker), kapauimo (big deer that keeps wasp honey in its throat) etc. In the second place, all of them are “eaters of people” or cannibals and, thirdly, they are found in places where the men also circulate, in the forest and river. Although they mention the existence of feared birds, possessed by jorokó, there are no cannibal celestial beings. As they say, “in the past, birds and fish were like people. When people see a bird that has been shot with an arrow, it’s because one cannot kill it, for everything would become dark. A bird shot with an arrow has an owner”. It is, nevertheless, the aquatic world that has an exceptional place in the life of the group, involving a knowledge that is quite widespread and described in many details. In the deepest places of the rivers, there are, in each hole, zue, various "water beasts", each of which has its “owner”, and which at any moment can attack humans. This explains the avoidance of navigating or taking baths near the deeper places that every individual can identify near the villages and surroundings. The physical aspect and size of these beings are quite varied, for they can assume animal appearance, or human appearance, or recall the form of an object. They are called ihpory (or ipo, in Wayana), and each one is also identified by the suffix imo, which confers an exacerbated and monstrous aspect to the species – as occurs with several beings of the forest considered dangerous. Thus, maxipurimo refers to a large tapir (maxipuri), that lives in one of the deep parts of the river. The ihpory only come out of their holes at night, which are hidden behind the hills, living in villages at the bottom of the river – villages which are like those of Wayana-Aparai society. It is worth noting that while the ihpory, which are identifiable in space, do not bring sicknesses but do kill, the jorokó, who have no definite dwelling-place, inversely cause sicknesses the consequences of which, however, can be repaired, by curing or avoiding death. This creates a situation of perpetual vulnerability of humanity to the attack of malicious beings. In the case of the sicknesses and misfortunes caused by the jorokó, these can be repaired or “negotiated”, and those which are responsible for the harm done will help in eliminating it. But meeting an ihpory and other cannibal beings, inhabitants of the forest, is always fatal. The death of several ihpory has served as inspiration for naming various settlements, whose “holes” today serve as sorts of geographical markers. The origin of the rituals and all the paraphernalia associated with them is attributed both to the beings of the forest and of the waters. However, it is the beings of the waters, the toponymy of which is known to everyone, that exercise a more direct influence on daily life. We should associate this fact with the importance that the rivers exercise in the dynamics of the life of the group: from the point of view of territorial occupation and economic exploitation, the river functions as a channel of communication among the settlements and with other territorial and ethnic groups. This explains why the aquatic world serves as the great socio-symbolic paradigm. The controller principle and the relation among beingThe world is not thought of in hierarchical terms and, as has already been said, there doesn’t exist the idea of a supreme being acting directly on the lives of humans. The principles of nature with which men are in contact are not placed in opposition to the supernatural world, but to intermittent mutual conflicts. If the idea of a supreme being does not exist and if all forms of life have the same free will to cause evil, it is necessary that there exist some principle in the universe that protects beings from extinction. Nature has its controllers which are related to men, but there are different controllers. Thus, there is a controller principle for each domain and species of nature, which watches over it and controls it. In relation to the domains of nature, to edible plants and to game animals, they refer to their "father", zumy. They speak of ituzumy, the "father of the forest", tunazumy, the "father of the water", kanazumy, "father of the fish", ywizumy, "father of manioc" (meaning edible plants) and tonsezumy, "father of game animals". A “chief” or tamuru is attributed to each species. In this way, for animals (onyky), they refer to the onykyry tamuru or kaikuxi tamuru. Kaikuxi, in the Aparai language, means "jaguar", which among all the animals is the most feared, which could explain the appropriation of this term to designate also the “owners” of the animals. The "time of the ancient ones", or “mythic time”, is characterized by the time of the lack of differentiation, when all beings communicated amongst themselves. Men and animals had the same attributes and the animal-human metamorphosis was a constant way of resolving crisis situations, disobedience, abuse, excess or lack, caused, in the last analysis, by the conduct of the beings and creator heroes. However, one day, Ikujuri, tired of such abuses, decides to put an end to this situation of identity, by creating alterity: the differentiation between the species, among men (ethnic and linguistic) and among the living and the dead. From that time on, the relation between men and animals changed: the men needed to hunt, fish, and learn how to plant in order to survive. Several species of the animal kingdom went on to have their “owner” and, thanks to them, men can more easily hunt and fish through a sort of “treaty” of concessions. Before, the water was the sky, the birds were fish and everyone fought amongst themselves. These days, when a fish comes close to the surface of the water, making it possible to catch it, it means that its owner is away, that is, the owner is not taking care of its -poetory, or those that obey the owner of that species. Thus, they say: “when one sees many fish it is because they are dancing”. However, if in the dry season there is an abundance of fish, fishing cannot be done without certain precautions, for this would cause the anger of the owners of each species, resulting in sicknesses. In the forest, in the same way, to be able to hunt an animal means that the owner of that species has let it go. They explain: “in the forest, all ipoetory walk together with their owner”. Edible plants are associated with the “owners of manioc", from whom one learns to plant and prepare food. One cannot forget that manioc is the basis of the food diet. As for the other useful plants, such as those used for medicinal purposes, there is no single entity that controls them, such as "owners", "masters", "chiefs" or "mothers", very common in the ethnography of other indigenous groups. Among the traditional remedies, 90 % are made from plants and all are controlled by the jorokó. A very long time ago, in order to deal with the constant threat of attacks by certain animals, humans engaged in relations of affinity that immediately after were “consanguinized": the animals were transformed into husbands, wives, parents or grandparents. Thus a myth is told how one day an Aparai man married, without knowing, a jaguar, whose “people” customarily attacked them. The marriage put an end to this conflict and the daughter who was born from this relation gave rise to the Kaikuxiana (kaikuxi, jaguar) people, who are considered one of the ancestors of the Aparai. Besides settling questions of war through marriages, the animals are sources of knowledge. With some of them, men learned the songs, dances, graphic motifs, Technologies of objects, how to cure, hunt, etc. It is interesting that it is in situations of isolation from social living that the men learn such knowledge. This is seen in the narrative on the origin of the great ritual, the festival of Okomo, which the Wayana and Aparai learn from the japim (jakakua) bird: while a man is lost in the forest, he hears and sees this festival and, while he is in the woods, he becomes related to the animals, eating with them, having sexual relations, etc. Thus, in the “mythic” times, the conviviality of men and animals is marked sometimes by friendly relations, sometimes by conflicts; sometimes by reciprocity, sometimes by competition. What distinguishes this time from the present is the type of communication. Before, all the beings and elements of the cosmos communicated amongst themselves and it was this communication that allowed for cultural transmission, which among the Wayana and Aparai is done preferably with the animals and it is about this that they most like to tell stories. Many myths also tell of war adventures against the beings that “looked like people, but they were beasts". Despite the fact that some of these were peaceful to humans, even so their death is desired. Such stories refer to the moment when the non-differentiation among beings was broken and substituted by relations of alterity, leading to a situation of permanent watchfulness against possible conflicts. Once this split occurred, several beings were endowed with the capacity to live in society while others were not, and those who were not received the definitive form of animal or plant. In the same way, only some humans were endowed with the capacity to see and to visit other worlds, for the purpose of requesting assistance with the problems of this world (sicknesses, economic misfortune, social disorders, etc. ), for, those who are responsible for these problems belong to the other worlds. Having broken the direct communication between humans and animals, the relation of reciprocity gives way to one of “negotiation”, which is mediated by the shaman. Animals are killed because they are “beasts”, not humans, and because it is necessary to eat. And when the animals become food for men, a relation of reciprocal predation is established among them, to the extent that sicknesses and misfortunes result, in large part, from the attacks of those beings. Confeccionando um bracelete feminino na aldeia Apalai. foto: Paula Morgado, 1989. Besides the creator/transformer principle, ikujuri, the universe contains its opposite: the jorokó, which is capable of materializing in animals and of taking control of other organic forms, acting on its own or being manipulated by men. Like the vital principles, these are present in all domains and feed off the first. As we have mentioned, on dying, besides the setting free of uzenu, another specter is let loose from the body, the akuari'po, or "bad specter of the spirit of the dead", which "is no good" and stays on the earth, being able to do evil to humans . After the uzenu góes to the village of the dead, the old spirits become new, without sicknesses. On Earth, in compensation, the akuarihpo remain, which can cause sicknesses. Akuarihpo is, in reality, a kind of jorokó, and the Wayana and Aparai explain that a day will come when there will be so many jorokó on earth that it will “fall” and the sky above will come crashing down and so on consecutively. 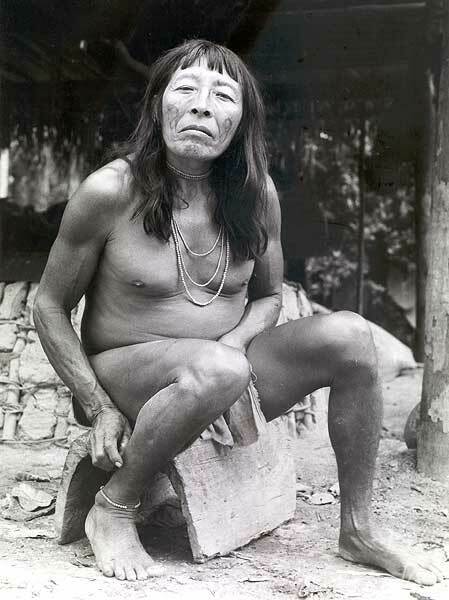 However, it is necessary to distinguish the akuarihpo of men and those of the shamans: the first is not endowed with consciousness and is maintained “alive” by the desire to feed off the vital principle of individuals, without distinction; the second is endowed with consciousness and will and has attained the same superior level as the other jorokó. In their struggle to control the spirits, the shamans appeal both to the jorokó and to the akuarihpo. There are several immortal jorokó (such as Axiporiê, Wasaimo and others), which does not happen with the akuarihpo, which can be “dominated” by the shamans. The shaman’s apprentices can acquire various akuarihpo and it is admitted that they can incarnate in certain animals that one should avoid killing. The destruction of material goods when a person dies is certainly associated with the fact of wanting to eliminate whatever material remains that recall its owner and can attract its akuari'po. In contrast with the animals, which can integrate the jorokó in their very being, for humans, to have jorokó leads to sickness and death. Some animals are permanent carriers of jorokó, while others are only temporary receivers. 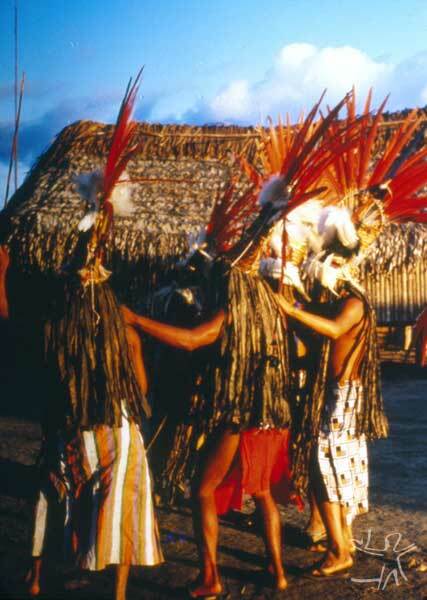 Only the powerful shamans know how to store them in their bodies, for "the one who has jorokó is a beast". When “someone speaks a lot about another”, "is prone to fighting", that is, he comes to behave in a way that is against the social norms, it is because he is possessed by the jorokó, "he is dirty inside". Today the shamans explain that they are no longer capable of storing them in their bodies, but they can dominate them, turning them into their “helpers” and each one creating a particular stock of them. The “good” shamans know where they live and can resort to them when they need to, whether for curing, or for aggression. In short, the jorokó is a destroyer principle and, at the same time, restorative principle, which is an integral part of the world. It is capable of materializing temporarily through the living, manifesting itself at death, in sickness or permanently. They are beings which provoke fear to everyone: humans or animals which in the “ancients times", through carelessness or transgression of the rules, were transformed definitively into jorokó, birds, beasts of the forest and water. Thus, men live in a perpetual state of watchfulness and defense, fearing the attack of cannibal beings, inhabitants of the forest or the river. But it is in relation to the jorokó, whose power is diffuse and invisible that they have the greatest fear. Today, only the shamans are able to communicate with them and thanks to their skill in negotiating, they are able to repair the evil sent and prevent new evil stuff from being reproduced ad infinitum. Nevertheless, if people are no longer able to see them, they are capable of feeling their presence, through physical sensations in the environment – a strong wind, a brusque change in weather or any abnormal accident of nature –, through sicknesses or economic and ecological misfortunes or social problems (interpersonal conflicts, fissions in political units, etc.). Festa de Okomo (em aparai; eputop em wayana), ritual Aparai-Wayana. Foto: Protásio Friekel, 1955. Life cycles and natural cycles are not necessarily accompanied by collective rituals, except at puberty, the ritual for which marks the entry into the adult phase (Okomo, in Aparai). This ritual can be repeated at other times in the adult phase of life as a kind of confirmation and act of bravery; however, since the beginning of the 1980s, this custom has been practiced less and less. 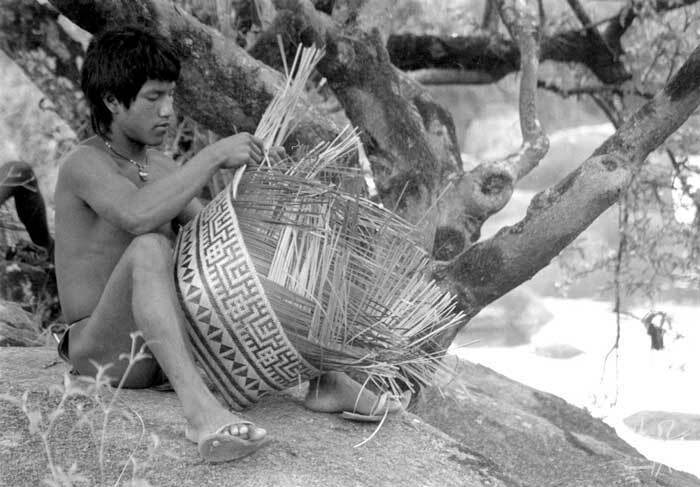 Preparando os olok (em wayna; orokó em aparai), adornos para a festa de Okomo (em aparai; eputop em wayana). Foto: Lúcia H. van Velthem, 1975. There are no age classes that serve as markers for passage rites, but there are festive occasions of a more social nature which have become important moments for transmitting knowledge, even if they are not directly connected to the development of subsistence activities or phases of the individual life cycle, although they may be influenced by them. The festivals can take place with only the members of a single village or bring together kin from other villages, in such a way as to mark social frontiers, the webs of relationship – those with whom I can trade, what I can trade, those with whom I keep a greater social distance – of hostility or total enmity. Besides that, in the festivals, when alcohol consumption is quite high, the ideal of moderation in conduct gives way to outbursts of emotion, and extra-marital relations are common. The festivals, which last on the average from three to four days, end when there is nothing more to drink. Festa de Okomo (em aparai; eputop em wayana). Foto: Lúcia H. van Velthem, 1975. The period of greatest festivity occurs between the end of the ripening of the manioc and the beginning of a new cycle, before the next planting, that is, in the period between harvests, when they spend more time on leisure. There is no festival without beverages, there is no beverage without a good harvest, since the beverage consumed is made from manioc, particularly caxiri and sakurá. The things that are considered positive in a person’s life – success in hunting, fishing, purchase of the first rifle, a successful journey, etc. – are transformed into reasons to hold a festival. On the initiative of a member of the village, the chief decides when and where the festival will be held. The quantity of beverage is seen as a marker of hospitality and generosity: the chief is considered “good” when he knows how to receive guests well, that is, when there is no lack of beverage at his festival and when everyone enjoys themselves and there are no fights – up to a short while ago, this quality was also measured by musical performance, of songs and dances which have today become scarce. (On the French Guiana side, on the upper Maroni, the festivals since the end of the ‘80s have been accompanied by highly sophisticated electronic music organized by the youths). Everything is measured and critically observed by all the participants, as though the festival functioned as a kind of social regulator. It is a moment when knowledge, of those who organize the festival and the public which participates in it, is put to the test: those who know gain an increase in status while others try to make an effort to learn. Kurumorueny – flute of the vulture. Since the 1970s, the repertoire of festivals has been diminishing considerably, with only a few names and vague memories remaining. Besides that many of them have come to be celebrated at Christmas time, by virtue of the Indians’ living together with government employees and missionaries (who worked together to reduce the number of festivals). However, despite the social transformations which have exercised a direct influence on the repertoire, periodicity and meaning of the festivals, they continue to remind individuals of how their social world is organized, reiterating ethnic and moral values, teaching people how to act and to become a person. Retrato de Dondon, então chefe wayana da aldeia Anapuaka. Foto: Daniel Schoepf, 1972. Traditionally, the Aparai and Wayana do not recognize a form of political organization and/or leadership that transcends the limits of the village. Each village is, in principle, politically autonomous, having its own chief, called pata esemy ('chief of the village'), typatakemy ('the very chief of the village') or even by the term tuisa (or tamuxi in Wayana). However, in certain contexts, it is possible that a leader comes to perform an outstanding role in the making of decisions that mobilize Aparai and Wayana society as a whole (understood, here, as the group of villages and local groups in Brazilian territory). When that occurs, the influence of this leader transcends the limits of his village and extends to his local group (the set of villages which are genealogically and/or geographically close) and, at times, to other more distant villages. The authority of the chief of the village over its members is restricted, depending on the social distances among these members, the prestige that he gains and his capacity for persuasion. Generally speaking, it is up to the village chief to coordinate community activities (such as the cleaning of the plaza) and activities that go beyond the limits of the village, as for example, in questions of external politics, whether intra- or interethnic(festivals, rituals, meetings, etc.). In larger-sized villages, which encompass more than a single domestic group, political space is open for those men who ‘lead’ their domestic group and end up exercising some influence on political decisions in the village. Besides that, certain activities which take place through cooperation among individuals demand the formation of a temporary leadership in order to make things happen. For example, the festivals and the rendering of services in the form of a ‘collective work party’ (cleaning gardens, making canoes), which requires the hiring of several employees or, as they say, muruku. In both cases, there is a ‘chief’ who organizes the respective activity, called aporesemy. This word shares the same lexical root, emy, that denotes a hierarchically superior position of ownership and authority, that is, "chief" and "owner", simultaneously – employed also in the case of the 'village chief', pata esemy or typatakemy. The reciprocal position to that of the village chief is that of his subordinates and co-residents, generically designated by the word -poetory. This is an ‘institution-relation’ widespread among Karib language-speakers of the Guianas, which is understood and characterized in distinct ways by each group. For many groups, as among the Aparai and Wayana, this relation has a strong asymmetric connotation, referring to positions that are considered hierarchically inferior, like those of son-in-law (daughter’s husband), 'employee', 'servant', 'prisoner' or 'slave'(Rivière, 1969:81). Generally speaking, the chief of the village corresponds to a ‘father-father-in-law’ who joins around his figure his single sons and daughters, married daughters, daughters’ husbands and grandchildren and, at times, married sons and their wives. Besides these, he can also join around him his brother (s), brothers-in-law (sister’s husband), among others. The relation father-in-law/son-in-law involves a series of obligations of the son-in-law to the father-in-law as soon as the alliance is established, such as the cutting of a garden, the building of a house, the making of a canoe. Besides that, during his lifetime, the son-in-law must render services to his father-in-law whenever he is asked and offer him presents through his wife. In a way analogous to what occurs between spouses, industrialized goods have co-existed with “traditional “ obligations and even have “substituted” them. Yet, these forms of obligation do not necessarily exclude each other, and can be found associated in accordance with the power of the particular father-in-law. Among the criteria used to judge the worth of a future son-in-law, as well as the pertinence or not of the marriage, is – besides the obvious determining factors of genealogical (terminological ) distance and geographical distance – whether or not he is a “worker”. That is, the readiness and aptitude of the future son-in-law to perform the services mentioned above and, above all, his capacity to acquire industrialized goods for his wife, father-in-law and mother-in-law, by producing and commercializing artwork, rendering services to the Funai or working on nearby prospecting sites. The intensity of these obligations seems to vary according to the genealogical and /or geographical nearness/distance between the father-in-law and son-in-law. Thus, when the son-in-law is a co-resident, he has more obligations and capacity to comply with these obligations, than someone residing in another village. On the other hand, if there exists some genealogical link or tie of affinity between the families of the father-in-law and son-in-law, the obligations also tend to be minimized. The relation between father-in-law and son-in-law extends to the rest of the extended family, serving as a hyperbolic model of asymmetric relation and of power. Thanks to this relation, domestic groups stay together and local groups take shape. However, although ideally, as a counterpart of the services rendered by the members of a village, its chief has the obligation to organize festivals, to be a good host and, above all, to divide and redistribute goods (these values are frequently mentioned when criticizing present-day leaders), the father-in-law does not seem to have any obligation to his son-in-law. As has been said, among the Aparai and Wayana, there is traditionally no form of leadership that transcends the limits of the village and, in the last analysis, the local group. 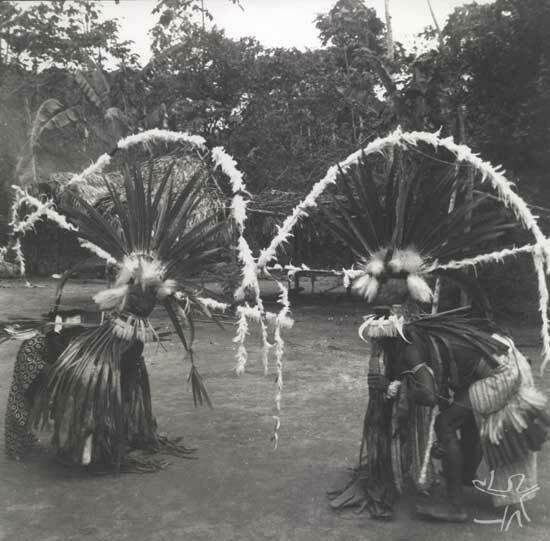 However, after 1973, with the beginning of the assistance activities by the FAB and the Funai, there emerged the need to create a broader leadership, a representative of all the villages, who could serve as an interlocutor between indigenous society and the government and non-indigenous society. Progressively, the decisions that affect the Aparai and Wayana in general came to depend on the consent of this single leader, sharpening and producing tensions among village chiefs, villages and families. This model, although implanted more than 30 years ago, still has a great deal of difficulty in co-existing with the form of traditional power. One can verify an enormous dissatisfaction on the part of various individuals (leaders or not), who accuse the general leadership of benefiting only his kin and close allies. In 1996, through a political maneuver which articulated the interests of a specific Aparai family and the interests of the administration of the local Funai, the Association of the Indigenous Peoples of the Tumucumaque (APITU) was created. In principle, this association represents the indigenous groups that inhabit the Indigenous Park of the Tumucumaque and the East Paru River Indigenous Land: Aparai, Wayana, Tiriyó and Kaxuyana, among others. However, most people do not know how the APITU functions, that it is ‘controlled’ and disputed by a minority which is more familiar with the codes of the surrounding society, such as new forms of organization, representation, and political activities. Finally, one notes that the authority of the president of the indigenous association in no way supercedes that of the village chiefs. On the contrary, the president of the association depends to a certain extent on the consent of several more influential village chiefs to make several decisions. Fazendo beiju. Ffoto: Daniel Schoepf, 1972. Like most of the other indigenous groups of the region of the Guianas, the Aparai and the Wayana have a subsistence economy, based on hunting, fishing, gathering and cultivation of fruits and root crops. These economic activities are defined by two seasons that divide the year throughout the northern region of the country: "summer", or the dry season, which covers approximately the period between the months of July to December; and "winter", the rainy season, between January and July. This annual cycle guides not only the calendar of activities – particularly the clearing, felling, cleaning, burning, planting and harvesting of the gardens –, but also the appearance of animal, fish, and fruits species available and, consequently, the food diet of the Aparai and Wayana. Generally speaking, in the "winter", during the rains, the consumption of root crops is reduced so as not to produce a shortage for the rest of the year, until a new harvest is made. Fishing diminishes with the level of the rivers and streams, and, in counterpart, hunting is given greater emphasis with the emergence of small islands along the river, where animals are forced to stay. In the "summer", in turn, most of the time is used for preparing the earth to plant the gardens, this also being a period which is quite good for fishing, given the concentration of fish in the lakes and small water courses. Moqueando peixe. Foto: Daniel Schoepf, 1976. The tasks are organized according to a rigid sexual division of labor. It is up to the men to hunt, fish, clear gardens (felling the trees, burning and cleaning) and make new settlements, build houses, and also produce all of the woven domestic utensils (fans, baskets and recipients, manioc squeezers, etc.). 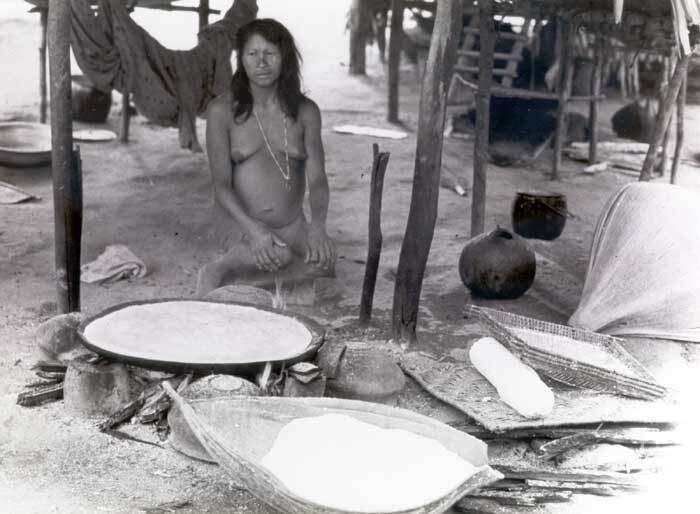 The women are responsible for fetching water and taking care of the fire, the preparation of food, the processing of root crops (producing manioc flour, bread and, above all, beverages (fermented), and all production of ceramics (pots and ovens to toast manioc bread and manioc flour) and weaving of cotton (hammocks, straps, etc.). Both sexes participate in gathering, planting and harvesting of the garden products, and the great fishing expeditions using timbó poison held during the dry season.The basic units of production are the nuclear family and the domestic group, that is, the married couples, their single and married sons and daughters, in-laws, co-resident sons-in-law and daughters-in-law. Each married couple has between one and three gardens, in different stages of development. The gardens are located near the villages, in places that are selected or accepted by the founder or chief of the village, in accordance with such criteria as soil quality, the rains (lands that are not flooded), the occurrence of pests (leaf-cutter ants) and animals (wild pigs, etc.). When the parents of one of the spouses live in another village, often the married couple clears a second or third garden near that village, frequently visiting them. Besides that, newly-weds can share the garden of the parents of one of the spouses until they are able to make their own garden. In the gardens various species of root crops are cultivated (more than 30 species of manioc, cassava, sweet potatoes, yams, etc. ), sugarcane, fruits (bananas, watermelons, pumpkin, mango, maracujá, cherimoya, orange and lime), cotton, urucum dye and genipap. Several types of fruits are planted around the villages. Throughout the year, expeditions are made into the forest for hunting and gathering. Gathering is practiced with the same level of intensity, complementing the food diet. These expeditions involve the married couple or, more frequently, groups of brothers, in-laws, father and sons. The following items are obtained: wild honey, açaí and bacaba, insect larvae, turtle eggs (on the beaches, during the dry season), arumã for making baskets, plant resins, clay and argil for the production of ceramics and mineral dyes etc. Through hunting, the Aparai and Wayana add to their diet: tapirs, deer, rodents (paca and cutia, for example), monkeys (cuatá and guariba among others), wild pigs (peccary and boar), birds (curassow, jacamim, toucan), alligator and lizards etc. The techniques used depend on the species of animal being hunted and the time of the year. In the period before the festivals, above all, groups of men make expeditions several times into the forests which can last weeks and in which large quantities of animals are killed. In the dry season, small expeditions into the forest are made on a daily basis in which the men “wait” (mutá) in the gardens or near the fruit trees; in the period of the rains, they hunt with "headlights" (animals are killed on the riverbanks at night). In any case, the Aparai and Wayana use shotguns, which have been familiar to them for more than a century. Although hunting is done throughout the year, the best time for expeditions is the rainy season, when several animals are stuck on islands due to the rise in the river levels. Fishing is also characterized by a diversity of fish caught and techniques used: tucunaré, surubim, pacu and piranha are some of the species obtained in the region. The predominant technique is with industrialized hook and line, but also “thresher” nets are used (above all, during the time of the rains), bow and arrow and tmbó plant poison (in the dry season). Traditionally, the Aparai and the Wayana did not raise animals for food. Besides dogs for hunting and commercializing with other indigenous groups, they raise ducks, chickens, and several forest species (curassow, jacamins, toucans and macaws, monkeys and peccary). These animals are usually not eaten, only chicken and duck eggs and, even so, only in situations of shortage. They also don’t produce surpluses to commercialize, except small quantities of manioc cereal transported on journeys, sold, in the past, to extractivist laborers who worked in the region during the decades from 1920 to 1960, and, actually, at prospecting sites near the indigenous area. With the passing of time and the intensification of relations with the surrounding society, the quantity, assortment, and dependence on industrialized goods has become ever greater. Before, there was little diversity of these goods, comparatively speaking, being restricted to metal tools, firearms, cloths, beads, suitcases, and various trinkets. These days, besides these items, there are portable radio/tape-players, cosmetics, canned foods, motorboats and an infinite variety of other articles. This change in access, use and dependence on industrialized goods on the part of the Aparai and Wayana has been promoted since the first half of the 20th Century by profound transformations in the relations established with certain segments of the surrounding society. Until the end of the 19th Century, the Aparai and Wayana depended on the Meikoro as intermediaries in acquiring industrialized goods, negotiating with them through individualized and exclusive formal trade partnerships, based on ‘credit’ and advance payment in merchandise (see chapter "History and interethnic relations"). Since that time and particularly between 1920-50, the Aparai and Wayana switched to favoring their relations with extractivist frontiers which became established in the region, providing foods and rendering services in exchange for industrialized merchandise (in quantities and assortment which were much greater than those acquired until then) and even for money. However, it was from the 1960s on, with the beginning of assistance activities by the FAB, Funai and the missionaries of the SIL, that the acquisition of industrialized goods went through major transformations. Such transformations occurred not only in terms of the quantity and variety of available industrialized articles, but also in relation to the modes of acquisition. The indigenist policies that have been implemented are aimed at ‘educating’ and familiarizing the Indians with the monetary economy and the selling of salaried manual labor. Among these policies, the following are noteworthy: stimulating the production and commercialization of artwork, the installation of 'canteens' and trading posts for selling industrialized merchandise in several villages, the hiring of Indians to perform temporary or permanent services. O aparai Mikita fazendo uma cesta em aldeia no Rio Paru de Leste; ao fundo, sua esposa wayana. Foto: Daniel Schoepf, 1976. Between the years 1968 and 1992, the Aparai and the Wayana on the East Paru River lived together with North American protestant missionaries of what was then called the Summer Institute of Linguistics (SIL, today it is also called the International Linguistics Society). Along with their proselytizing activities, and education proposals, these missionaries initiated work for ‘recovery’ and encouragement of commercializing articles of Aparai and Wayana material culture, seeking to guarantee the economic self-sufficiency of these Indians and to familiarize them with monetary and mercantile economy. At the end of the 1960s, a ‘canteen’ was established where Aparai and Wayana artwork could be exchanged for manufactured goods, under the direction of an Aparai Indian named Zé Pereira. 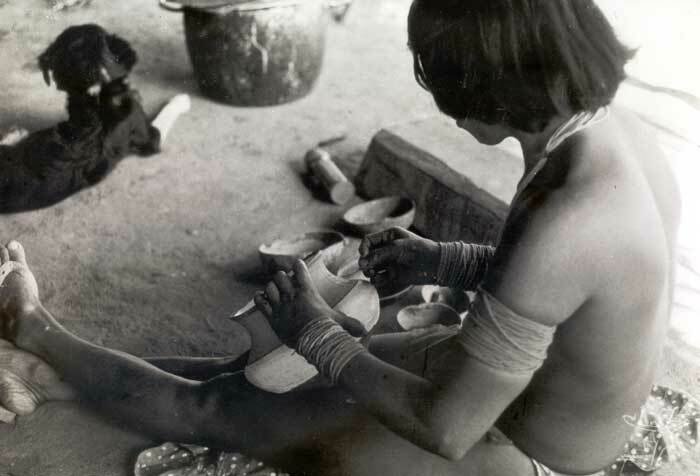 After Zé Pereira’s death, a new ‘trade canteen' was created in 1975, also with the support of the missionaries and under the responsibility of another Aparai Indian, Jaké. The latter, until recently, was the principal intermediary in the commercialization of artwork and industrialized goods between the cities of Macapá and Belém and the indigenous villages. Between 1977 and 1990, there was a great increase in the production and commercialization of Aparai and Wayana artwork, which has been supported since then by the Funai and its Artíndia Program. From 1997 on, the Association of Indigenous Peoples of the Tumucumaque (APITU) initiated the Tykasahmo Project for encouraging the production and commercialization of Aparai and Wayana artwork, with financing from the Demonstrative Projects Subprogram (PD/A-PPG7), and the installation of three new ‘canteens’ for buying and selling in the villages. From the beginning, when it was still being encouraged by the missionaries of the SIL, production of items which were exclusively for commercialization resulted in changes in Aparai and Wayana material culture. Progressively over time, items of material culture have been stylized, and produced exclusively for commercialization while, in the daily life of the villages, these same items have been substituted for industrialized goods. Besides that, one can see a broader phenomenon of transformation of culture – in its more ‘substantive’ forms: material culture, festivals, rituals, and knowledge – into merchandise, which have been reshaped to represent a stereotyped ethnic and cultural identity and a means to obtain resources for acquiring industrialized goods. Besides the commercialization of artwork, many Aparai and Wayana have sought to dedicate themselves to other activities such as the rendering of services and work in nearby prospecting sites, or for the assistance agencies (Funai, FAB, government of the State of Amapá). 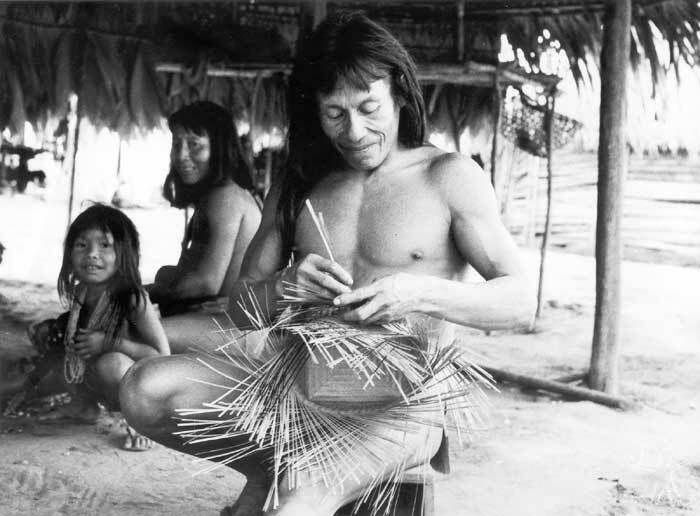 After 1994, the APITU established a series of agreements with the state government of Amapá, which greatly increased the number of Indians hired as: indigenous teachers, health monitors, pilots and 'bowmen' for boats, advisors for the production of artwork, nurse assistants. Consequently, the Aparai and Wayana are using money more and more as a measure of worth and means of trade (currency) in various transactions outside and inside the villages. BARRETO, Felicitas. Wayana Apalaís. In: BARRETO, Felicitas. Réquiem para os índios. São Paulo : Ground ; Global, 1979. p. 115-52. BOVEN, K.; NIE, M. van. A Wayana shaman, sessions and spirits. Revindi, s.l. : s.ed., n.2, p.3-17, 1988. CAMARGO, Eliane. Aspect de la phonologie du Wayana. Amerindia, Paris : AEA, n.21, p.115-36, 1996. --------. Identidade étnica, identidade lingüística : o bilingüismo entre os Wayana e os Aparai. In: CONGRESSO DA ASSEL (6º. : Rio de Janeiro, 1997). Multilingüismo em foco : estudos da linguagem, limites e espaços. Rio de Janeiro : UFRJ, 1997. p.89-99. CAMARGO, Eliane; LOPES, Paula Morgado Dias. Les Aparai, une minorité amazonienne. Mandragore: Revue des Litératures Orales, Pathernay : Cerdo, s.n., 17 p., 2000. --------. Tratando-se bem : guia prático de termos e expressões relativos a sintomas clínicos em Wayana e Aparaí. São Paulo : USP/NHII, 1996. 72 p.
CAMARGO, Eliane; RIVIÈRE, H. Trois chants de guerre Wayana. Amerindia, Paris : AEA, n.26/27, p.87-122, 2001/2002. CHAPUIS, Jean. La personne Wayana : entre sang et ciel. Aix en provence : Université d’Aix-marseille, 1998. 1082 p.
COSANDEY, Roland. Un film palimpseste : Yopi: Chez les indiens du Bresil, Felix Speiser (1924/1945/1994). Bulletin de la Soc. Suisse des Américanistes, Genévé : Soc. Suisse des Américanistes, n. 66/67, p. 199-214, 2002/2003. COSTES, Guilhaume. Du refus du Parc du Sud par la population Wayana. Revue Le Pou d’Agouti, s.l. : s.ed., n.18, 1996. COUDREAU, H. Vocabulaires méthodiques des langues Oayana, Aparai, Oaiapi e Emerillon. In: BIBLIOTHÉQUE Linguistique Americaine. v. 15. Paris : J. Maisonneuse ; Libraire-Editeurs, 1892. DEVILLERS, Carole. What future for the Wayana indians? National Geographic, Washington : National Geographic Society, v.163, n.1, p.83, jan. 1983. DROOGLEEVER, A. B. Fortuyn. Some data on physical anthropology of Oyana indians. Konninklijke Vereeniging Indish Instituut, v.69, n.22, p.3-24, 1946. FARABEE, Willian Curtis. The Apalai. The Museum Journal, Philadelphia : Univers. of Pensylvania, v.10, n.3, p.102-16, jun./ago. 1919. --------. Apalaiis. In: FARABEE, Willian Curtis. The Central Caribs. Philadelphia : Univers. of Pensylvania, 1924. p.220-41. (Anthropological Publications, 10). FERNANDES, Eurico de Melo. Algumas notas sobre os Waiano e os Apalai do rio Jari. In: INSTITUTO de Antropologia e Etnologia do Pará. v.4. Belém : MPEG, 1952. FRIKEL, Protásio. Classificação linguistico-etnológica das tribos indígenas do Pará setentrional e zonas adjacentes. Rev. de Antropologia, São Paulo : USP, v.6, n.2, p.113-89, dez. 1958. --------. Fases culturais e aculturação no Tumucumaque. Boletim do MPEG: Série Antropologia, Belém : MPEG, n.16, nov. 1961. GRENAND, Françoise; GRENAND, Pierre; HURAULT, Jean-Marcel. Indiens de Guyane : Wayana et Wayampi de la foret. Paris : Autrement/Orstom, 1998. 200 p.
GRENAND, Pierre. Différents traits d’acculturation observés chez les indiens Wayana et Waiãpi de Guyane Française et Brésilienne. In: JAULIN, R. (Org.). De l’ethnocide. Paris : Union Génèrale d’Editions, 1972. p.159-75. -------- (Org.). Les peuples des forêts tropicales aujourd’hui. v. IV: Région Caraíbes, Guyanes, Bélize. Bruxelles : APFT, 2000. 478 p.
--------; GRENAND, Françoise. Les amérindiens de Guyana française aujourd’hui : eléments de compréhension. Journal de la Société des Américanistes, Paris : Société des Américanistes, v.66, p.361-82, 1979. --------. L’occupation amérindienne, ethnoarchéologie et ethnohistoire. In: L’ARCHÉOLOGIE en Guyane. s.l. : APPAAG, 1997. HARTMANN, Gunther. Die Materielle Kultur der Wayana/Nordbresilien. Baessler Archiv, v.19, p.379-420, 1971. HURAULT, J. La francisation des indiens de Guyane. In: JAULIN, R. (Org.). De l’ethnocide. Paris : Union Génèrale d’Editions, 1972. p.123-42. --------. Les indiens Oyana de la Guyane Française. Journal de la Société des Américanistes, Paris : Société des Américanistes, v.50, n. 3, p.136-83, 1961. --------. Les indiens Wayana de la Guiana Français : structure sociale et coutume familiale. Paris : Orstom, 1968. --------. La vie matérielle des noirs regufugiés et des indiens Wayana du Haut Maroni. Paris : Orstom, 1965. 143 p.
--------. Vocabulário básico apalaí-português : dicionário da língua apalaí. Brasília : SIL, 1995. 163 p.
LAPOINTE, J. Residence patterns and Wayana social organization. Columbia University Microfilme, Ann Arbor : Columbia Univers., n.1971-17-516, 1971. LOPES, Paula Morgado Dias. Os Aparai, os Wayana e seus princípios cosmológicos. In: GALLOIS, Dominique (Org.). Sociedades indígenas e suas fronteiras na região sudeste das Guianas : contribuições etnográficas. São Paulo : USP/NHII ; Fapesp, 2003. --------. Avaliação preliminar do sistema educacional entre os Wayana-Aparaí : Relatório. Brasília : s.ed., 1993. --------. O pluralismo médico Wayana-Aparaí : a intersecção entre a tradição local e a global. Cadernos de Campo, São Paulo : USP, v. 4, n. 4, p. 41-70, 1994. --------. O sentido das Missões entre os Wayana-Aparaí. In: WRIGHT, Robin (Org.). Transformando os Deuses : os múltiplos sentidos da conversão entre os povos indígenas no Brasil. Campinas : Unicamp, 1999. p. 217-54. --------; CAMARGO, Eliane. A escola e a evangelização : dois projetos paralelos entre os Wayana-Aparai. In: RICARDO, Carlos Alberto (Ed.). Povos Indígenas no Brasil : 1991/1995. São Paulo : Instituto Socioambiental, 1996. p. 292-4. LOPES, Paula Morgado Dias; CAMARGO, Eliane; BARBOSA, Gabriel Coutinho. População Wayana-Aparai nas áreas do Parque Indígena Tumucumaque e Terra Indígena Paru de Leste. São Paulo : USP/NHII, 1996. MANGAÑA, Edmundo. Literaturas de los pueblos del Amazonas : una introducion Wayana. Madrid : Mapfre, 1992. 294 p.
MELLO, Beatrix Cardoso de. Usos, crenças e lendas dos Wayana-Apalai. Revista Geográfica Universal, n.16, p.25-38, 1976. MUSÉE D'ETHNOGRAPHIE. La marmite Wayana : cuisine et société d'une tribu d'Amazonie. Genève : Musée d'Ethnographie, 1979. 110 p.
RAUSCHERT-ALENANI, Manfred I. Armas de guerra e padrões guerreiros das tribos karib. Rev. do Museu Paulista, São Paulo : Museu Paulista, v.28, p. 423-34, 1981/1982. --------. Die Krankenbehandlung bei den Aparai-Wayana Indianer. Ethnologia Americana, s.l. : s.ed., v.18, n. 102, p.1037-9, jun. 1982. --------. A história dos índios Aparaí e Wayana segundo suas próprias tradições In: HARTMANN, Tekla; COELHO, Vera Penteado (Orgs.). Contribuições a antropologia em homenagem ao professor Egon Schaden. São Paulo : Museu Paulista, 1981. p. 233-54. RIVIÈRE, Hervé. Les instruments de musique des indiens Wayana du Litani (Suriname, Guyane Française). Anthropos, s.l. : s.ed., n.89, p.51-60, 1994. SAUSSE, André. Populations primitives du Maroni. Paris : Institut Géographie National, 1951. SCHOEPF, Daniel. Considerações sobre a literatura oral Wayana e as modalidades da sua transmissão. Bulletin de la Soc. Suisse des Américanistes, Genebra : Soc. Suisse des Américanistes, n. 59-60, p. 119-22, 1995-1996. --------. Essaie sur la plumasserie des indiens Kayapo, Wayana et Urubu : Bresil. Genévè : Musée d’Ethnographie, 1986. --------. Une étrange massue pour affronter les Wayapi ou les avatars de la technologie chez les Wayana de la region Brésil-Guyane. Bulletin de la Soc. Suisse des Américanistes, Genebra : Soc. Suisse des Américanistes, n. 57-58, p. 69-88, 1995. --------. Historique et situation actuelle des indiens Wayana-Aparai du Brésil. Bulletin Annuel du Musée d’Ethnographie, Genévè : Musée d’Ethnographie, n.15, p.33-64, separata, 1972. --------. Le japu faiseur de perles : un mythe des indiens Wayana-Aparai du Brésil. Bulletin Annuel du Musée d’Ethnographie, Genévè : Musée d’Ethnographie, n.19, p.55-82, separata, 1976. --------. Le récit de la crétion chez les Wayana-Aparai du Brésil. Genévè : Musée d’Ethnographie, 1984. --------. Un récite Wayana : le jaguar et le fourmilier. Musée de Genévè, n.248, 1984. --------; VELTHEM, Lúcia Hussak van. Wayana-Aparai. In: RICARDO, Carlos Alberto; GALLOIS, Dominique (Coords.). Povos Indígenas no Brasil. v.3: Amapá/Norte do Pará. São Paulo : Cedi, 1983. p.138-81. SOLIMÕES. Napoleão. Alguns mitos Wayana-Apalai. Rev. Atualidade Indígena, Brasília : Funai, n.22, p.13-6, 1982. VELTHEM, Lúcia Hussak van. A Área Indígena Paru d'Este : documentos e mapas para os Wayana e Apalaí. Belém : MPEG, 1993. 24 p.
--------. Comer verdadeiramente : produção e preparação de alimentos entre os Wayana. Horizontes Antropológicos, Porto Alegre : UFRS/PPGAS, v.4, n.2, p.10-26, 1996. --------. Das cobras e lagartas : a iconografia Wayana. In: VIDAL, Lux B. (org.). Grafismo indígena. São Paulo : Studio Nobel ; Edusp, 1992. p.53-66. --------. “Feito por inimigos” : os brancos e seus bens nas representações Wayana do contato. In: ALBERT, Bruce; RAMOS, Alcida Rita (Orgs.). Pacificando o branco : cosmologias do contato no Norte-Amazônico. São Paulo : Unesp, 2002. p. 61-84. --------. A mulher Wayana, seus espaços de transformação e fabricação. In: ALVARES, Maria Luzia M.; D'INCAO, Maria Ângela (Orgs.). A mulher existe? Uma contribuição ao estudo da mulher e gênero na Amazônia. Belém : MPEG, 1995. p. 51-6. --------. Onde os Wayana penduram suas redes? In: NOVAES, Sylvia Caiuby (Org.). Habitações indígenas. São Paulo : Nobel ; Edusp, 1983. p. 103-46. --------. A pele de Tuluperë : estudo dos trançados Wayana-Aparai. São Paulo : USP, 1984. 348 p. (Dissertação de Mestrado). Publicado com o título "A pele de Tuluperê : uma etnografia dos trançados Wayana em 1998 pelo MPEG. --------. Representações gráficas Wayana-Aparaí. Boletim do MPEG: Série Antropologia, Belém : MPEG, n.64, 20 p., 1976. --------. Wama-Aruma : mythos und technologie der Wayana-Apalai in Pará (Brasilien). In: MÜNZEL, Mark (Org.). Die mythen sehen : bilder und zeichen vom Amazonas. Frankfurt : Museum fur Volkerfunde, 1988. p. 278-330. --------. Os Wayna, as águas, os peixes e a pesca. Boletim do MPEG: Série Antropologia, v.6, n.1, p.107-16, 1990. Musique instrumentale des Wayana du Litani. The Wayan of the Litani (Suriname, Guyane Française. Buda Musique, 1996 (Coleção Musique du Monde). This page was last edited on 26 March 2018, at 16:47.